Financial Times is a free Financial Times Windows 8 app available under the ‘News & Weather’ category of Windows 8 store. This Windows 8 Financial app lets you access the updated global news, multimedia, analysis, and related comments. You can choose from various categories such as Companies, World, Markets, Lex, Line & Arts, Markets Data, and more. Using categories, you can access complete markets data including curries, markets losers, gainers, bonds, etc. This Financial Times app for Windows 8 brings you option to share the current news article, or search for a particular happening. The new edition comes up with an ability to save the content for you so that you can read it even if you do not have Internet signal. But, the Financial Times app is still under process. It’s a preview version where you get unlimited access to all the FT articles right on your Windows 8 system, in full-screen mode. To read all the articles, you need to register yourself with the app. Once done, enjoy reading all the articles anytime. 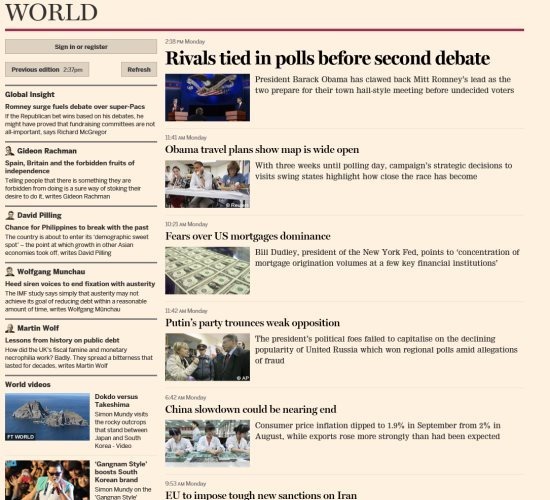 Now, to open the categories, just right-click anywhere on the FT screen ? a horizontal panel will appear including all the categories of FT app ? just click on one to read articles about it. Let me quickly point out the main features of this Financial Times app for Windows 8. Keeps you updated with global news, multimedia, analysis, etc. Includes categories such as Companies, World, Markets Data, Line & arts, etc. Save the content for offline reading. Needs registration unlimited access to all the FT articles. If you want to share the currently opened article, just press ‘Win+C’ to open the Charms bar ? a vertical panel will appear ? click on ‘Share’ option ? you will soon find the various ways to share the desired article with you friends. You can send them an email, or share via Facebook, Twitter, etc. To let the search bar appear, press combo of ‘Win+Q’. Type Financial Times and press Enter key. This will bring you the app. Now, click on the ‘Install’ button to download the app. Soon it will get installed and located in Windows 8 start menu screen. In short, Financial Times is a good utility financial times Windows 8 app to access global news constantly in full screen mode, right at your Windows 8 system. Go ahead and download Financial Times now.